This #GivingTuesday, To Write Love on Her Arms (TWLOHA) is launching the #into19 campaign. The goal of the campaign is to raise $125,000 by December 31. 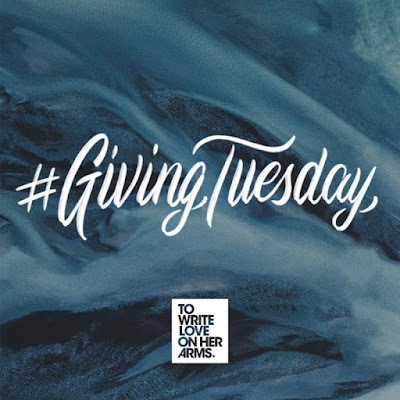 The campaign is anchored by the idea that each gift and donation will make it possible for TWLOHA to reach new communities, share more stories, and connect thousands of people to the help they need and deserve. Additionally, on Giving Tuesday, for every fundraising campaign set up through Facebook, the social media site along with PayPal will be matching up to $7mil in donations made to US-based nonprofits. This year TWLOHA sponsored 3,100 counseling sessions and launched a new FIND HELP tool. In just the past two months, the tool saw over 18,000 searches. For every four searches conducted, someone took the next step to reach out to a resource by calling a hotline or scheduling an appointment. Because of the support of people around the world, TWLOHA is making the distance between needing help and receiving help shorter than ever. In 2018, TWLOHA shared 100+ stories on their blog. These honest and vulnerable posts reached millions on their website and on social media each month. They were able to have a presence at 195 events, connecting with people at music festivals, the Vans Warped Tour, yoga events, colleges, and high schools, all to remind people that it's okay to talk about mental health - that it's okay to ask for help. "Our dream for 2019 is to reach more people with the message that they are not alone --that help is real," Lindsay Kolsch said. "We know it can save a life. The funds raised during this campaign will make it possible for us to do more next year." To Write Love on Her Arms is a nonprofit dedicated to presenting hope and finding help for people struggling with depression, addiction, self-injury and suicide. It exists to encourage, inform, inspire, and also to invest directly into treatment and recovery. Since its start in 2006, TWLOHA has donated over $2.3 million directly into treatment and recovery and answered over 200,000 messages from over 100 countries. The organization recently wrapped their 7th annual campaign to honor World Suicide Prevention Day (WSPD) and National Suicide Prevention Week (NSPW). With the help of supporters from around the world, TWLOHA was able to raise more than $200k for treatment and recovery, surpassing their initial goal of $100k, as well as their follow up goals of $150k and $175k. Over 3600 people donated to this year's "Tomorrow Needs You" campaign, in addition to the sale of 4655 World Suicide Prevention Day packs. The money raised will help sponsor nearly 4000 counseling sessions and connect 55,000 people to local mental health resources. As part of the campaign, TWLOHA shared an inspiring video featuring actors Chris Sullivan (from This Is Us) and Jaina Lee Ortiz (from Station 19), country music star Hunter Hayes, who raised $25,000, writer/artist Morgan Harper Nichols and singer/songwriter Matt Wertz, along with a number of clips submitted by TWLOHA supporters from around the world. Additional posts were made throughout the week by Cleveland Cavaliers player Kyle Korver, actor Jared Padalecki, American DJ Bassnectar, US Women's National Soccer Team players Christen Press and Ashlyn Harris, actress Susie Abromeit, and Norwegian DJ/producer KYGO, who personally donated $30,000 to the campaign, amongst others. Joining them were sites like Billboard, EDM Tunes, Country Music Tattle Tale, Your EDM, Hollywood.com and more sharing the message of hope and help.